The series hybrid Metrail is essentially a pure electric vehicle with an on-board auxiliary power unit that generates the power to recharge the battery packs as and when required. Additionally, Plug-in mains electricity can be used as a lower cost source of energy. The latest generation low emission, direct injection diesel engine and generator fitted to each carriage generates the main on-board source of electrical power for the electric drive train. These engines operate at a fixed generating speed but do not need to run continually. They have been digitally optimised to further reduce exhaust emissions and maximise fuel economy. FN proprietary brushless AC electric motors power each drive wheel and enables a smaller, more compact bogie design. Regenerative braking converts the kinetic energy from the Metrail’s motion into electrical energy. This energy is stored for future use to accelerate the monorail instead of dissipating it as heat. Without the usual bogie intrusions into the passenger compartment, Metrail maximises passenger capacity as well as producing a lower, flat floored vehicle, reducing the overall height of the carriage and improving stability. Reduced power requirements as a result of lighter carriages means that smaller, lighter engines, fuel tanks, batteries and traction equipment are used. Remarkable carriage body weight savings have been achieved in the construction of the Metrail carriages by the adoption of the latest lightweight construction materials, such as Carbon Fibre and Kevlar. The transference of well proven components from the technically advanced aerospace and automotive industries replace traditional heavy LRT chassis and bogie components, providing significant maintenance advantages. 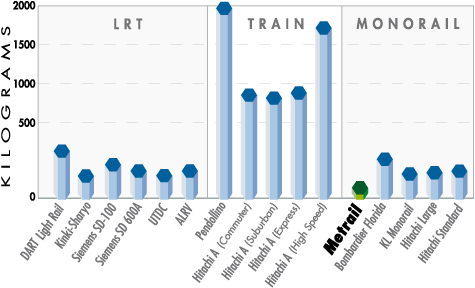 The low carriage weight per passenger ratio clearly demonstrates the efficiency of Metrail compared to other systems as shown in the graph below. 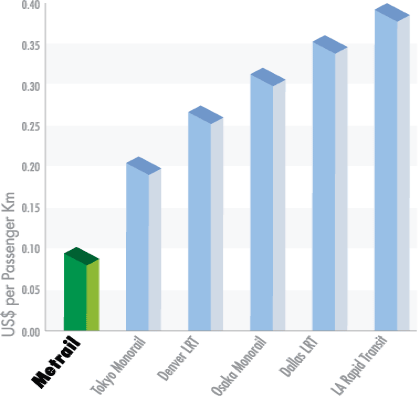 Metrail provides a radical new response to the key issues of global warming, increasing pollution and rising fuel costs. 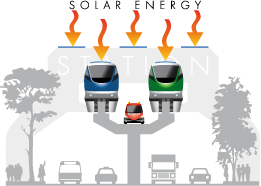 Metrail’s hybrid electric drive enables a variety of energy inputs to be harnessed; battery, IC engine and solar panels. Advances in solar panel technology have now made solar power generation a viable energy alternative. It is free, clean and available worldwide. 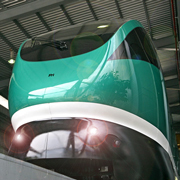 Solar panels fitted to the large, unobstructed roof area of the monorail carriages and stations provide a significant on-board energy supplement.